For the past 18 years, Bob Schieffer has been a familiar face on Sunday mornings as host of the CBS News broadcast Face the Nation. Now, he's sharing his favorite commentaries and insights from the program in his new book, "Bob Schieffer's America." Schieffer, 71, started doing them in 1994, after President Nixon died, saying, "Richard Nixon's life is a reminder that we can learn from the imperfect as well as the perfect." On The Early Show Tuesday, Schieffer told co-anchor Harry Smith, "I just thought the program that day needed a little button. I did that. I got a tremendous amount of mail. This was before e-mail. A so I tried it again a couple of weeks later. I wasn't quite sure what to make of it. And got more mail. So we just started making it a regular part of the program." At first, says Schieffer, he was afraid his bosses would take exception. But when they saw the reaction the commentaries got, they encouraged him to continue them. Still, does he think he's on a risky road with the commentaries, since he is, first and foremost, a reporter? "Oh, you know, I think it's kind of a way of disclosing. It's good disclosure. People know how I feel about things," Schieffer told Smith. "It's clearly labeled as commentary, but it's also good for my mental health!" he laughed. "I can't get out how I really think about things sometimes. It's my favorite part of my job." Schieffer says President Ford was his favorite politician. 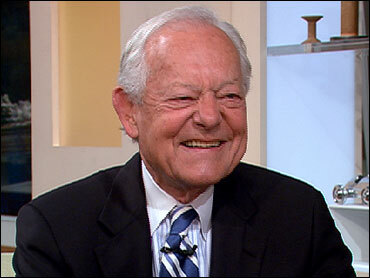 "I often disagreed with him on policy," Schieffer recalled, "but he was just one of the nicest people I have ever known. And I think most people who covered him would probably say about the same thing, Harry." Schieffer agreed with Smith's assessment that Ford was "a genuine person." "And," Schieffer added, "he (Ford) was used to being around the press. He used to come back when we'd be the pool on Air Force One. He'd come ... and he'd want to know all of the gossip. We never got anything out of him. He was always asking us about what about the 'What's...' 'Who's... ' all this kind of stuff. He was fun to be around." What's the biggest change in Washington since Schieffer got there? The much more intense partisanship? "It's quite partisan. Washington is a partisan place, but part of it, Harry, is the security. We're so walled off from officials now. A lot of that is because of security. When I came to Washington in 1969, most members of congress didn't even have press secretaries. Now, you know, they -- the chairman the Subcommittee on Hides and Skins has a media coach! -- and all that kind of business." Among Schieffer's favorite lines from any of his commentaries was this one: "I know a lot of nice people who lived in trailer parks and I know some real trash that lived in big houses." Schieffer told CBS News he "hated the impeachment and Monica Lewinsky story. I didn't like covering it at all. In one commentary, I say I felt sorry for the kid, she was sold out by her friends. She was taken advantage of. ... She was a child. I was disappointed, as a father of two girls -- where was her dad? It was news, but I took no joy in that. I just wanted to take a shower after that." Also, "I learned over the years that you can never judge a president when he leaves office. You have to wait a few years, at least, to see what his legacy will be. For example, Ronald Reagan was a better president than we thought of him when he left office. We didn't know what his impact on the Soviet Union would be -- his deciding to rearm." And, "If my life ended tomorrow I would not feel shortchanged. I would feel over-changed. This is what I wanted to do when I was a little boy. Not many people get that chance. I always think of myself as the luckiest person in the world." To read an excerpt of "Bob Schieffer's America," click here.